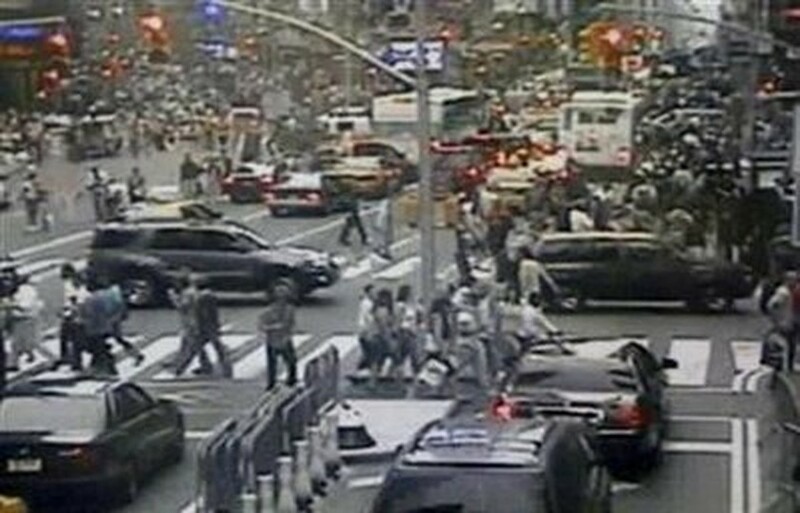 Beyond Times Square: Pakistani Terrorism Targets U.S.
Not long ago, a bomb attack on New York City's Times Square would have had intelligence officials and terrorism experts checking off the usual suspects among the sources of terrorist plots against the U.S. - Afghanistan, Saudi Arabia, Iraq. But these days, says a top counterterrorism official, "when I hear of a terrorist plot, I can count back from 10, and before I get to zero, someone will bring up the P word." Over the past couple of years, more plots against U.S. targets have emanated from or had a strong connection to Pakistan than any other country. Says the counterterrorism official, who was briefed on the hunt for the Times Square bomber but is not authorized to speak with the media: "It was totally predictable that the smoking Pathfinder would lead to someone with Pakistan in his past." Nor would it come as a surprise if it were revealed that Faisal Shahzad, who has claimed to investigators that he was working alone, was in fact linked to an ever lengthening list of extremist groups operating in Pakistan's northern wilds. These groups, whose attacks had long been confined to the Indian subcontinent, are now emerging as a deadly threat to the U.S. and its allies. As the core of al-Qaeda, led by Osama bin Laden, wilts under the constant pounding from the CIA's Predator drone campaign, Pakistani groups are mounting operations deep into the West. Such groups as Tehrik-e-Taliban Pakistan (TTP) and Lashkar-e-Taiba (LeT) have not yet notched major successes against U.S. targets to match Hizballah's bombings in 1980s Lebanon or al-Qaeda's destruction of two U.S. embassies in Africa in 1998. But they have lately mounted operations of great audacity and sophistication. LeT has been operating in Europe for at least a decade, initially raising funds from the large Pakistani diaspora in countries like Britain and France and later recruiting volunteers for the jihad against Western forces. At least one of the plotters of the 2005 London subway bombings was an LeT trainee, and British investigators believe the group has been connected to other plots in the U.K. The TTP, which claimed credit for Shahzad's failed bombing, was behind the suicide bombing that killed seven CIA agents in Afghanistan late last year. And in 2008, in the most spectacular attack by a Pakistani-based group on Western targets, LeT bombed and shot up a railway station, a hospital, two five-star hotels and a Jewish center in Mumbai, killing more than 160 people, including six Americans. Afterward, Indian authorities scanning a computer belonging to one of the Mumbai plotters found a list of 320 targets worldwide; only 20 were Indian.Now, security officials fear, Pakistani jihadis are spreading their operations across the Atlantic, recruiting U.S. citizens to their cause just as Britons were recruited a decade ago. If that assessment proves accurate, the Times Square bomb plot could be the first of more to come. What are the wellsprings of Pakistani radicalism? In the 1980s, many fervently Islamic groups were set up in Pakistan to fight the Soviet occupation of Afghanistan. After the Soviet withdrawal in 1989, however, these groups and their spin-offs did not lay down their arms but instead turned their attention to Pakistan's old enemy, India. Encouraged by Pakistani civilian, military and intelligence authorities, LeT, Jaish-e-Mohammed and others refashioned themselves as freedom fighters in the cause of Kashmir, the Himalayan territory claimed by both India and Pakistan. Pakistani officials regarded the jihadis as a proxy in their conflict with India, and Islamabad provided groups like LeT with land, funding and even military training, though it was understood that they could not attack targets in Pakistan or get involved in any operations against the U.S., Pakistan's ally. Though there was some low-key cooperation between the Pakistani groups and al-Qaeda, it didn't merit much attention from Washington.After the attacks of Sept. 11, 2001, however, the Bush Administration began to look more closely into bin Laden's alliances. Washington pressured the Pakistani government of General Pervez Musharraf to crack down on LeT, Jaish and others, which by then were on the State Department's list of proscribed terrorist organizations. But the government in Islamabad allowed the groups to continue operations - in December 2001, LeT attacked the Indian Parliament in an audacious move that nearly brought the two countries to war - with only cosmetic changes to their names. LeT, for instance, merged with its charitable foundation, the Jamaat-ud-Dawah. Gradually, the Pakistani groups began to broaden their targets beyond the Indian enemy. LeT propaganda, for instance, began to focus on links, real and imagined, between India, Israel and the U.S. By the mid-2000s, the group's leader, a former Islamic-studies professor named Hafiz Muhammed Saeed, began to call for a jihad against the West using language similar to those of the fatwas issued by bin Laden and other al-Qaeda leaders. LeT fighters began to venture out of their comfort zone, joining the fighting in Iraq. At the same time, a new group of radicals, the TTP, had begun to emerge along Pakistan's border with Afghanistan. While LeT, Jaish and other older groups were dominated by Pakistan's majority Punjabi ethnic group, the TTP was overwhelmingly Pashtun, the dominant ethnic group in Afghanistan. And the TTP never had any qualms about challenging the Pakistani state as well as NATO troops in Afghanistan. In 2007 its leader, Baitullah Mehsud, ordered the assassination of Benazir Bhutto and attacks on military targets; he also unleashed a wave of suicide bombings in Pakistani cities. While Pakistani authorities have continued to take a somewhat tolerant view of the Punjabi groups, their attitude toward the TTP is another matter. The army began to crack down on the group in 2008, and in the summer of 2009, a CIA drone took out Baitullah Mehsud. His successor, Hakimullah Mehsud, was thought to have been killed in another drone strike in January, but he re-emerged last week to claim responsibility for the Times Square attack. How plausible is that? U.S. officials were initially dismissive of the TTP's claims but began to reconsider once it emerged that Shahzad had been trained in bombmaking at a camp in Waziristan, which is Mehsud's stronghold. There is no doubt that the TTP and other Pakistani groups are now recruiting among Americans. Last October, the FBI arrested a Pakistani American, David Coleman Headley, and a Pakistani Canadian associate, for plotting to attack the Copenhagen offices of a Danish newspaper that had published cartoons of the Prophet Muhammad. More shockingly, the FBI said that Headley had been involved in the Mumbai attacks too (he had scoped out the hotels and the Jewish center for LeT) and was planning to bomb the U.S., British and Indian embassies in Dhaka, Bangladesh, before local authorities discovered the plot. In March, Headley pleaded guilty to all charges; he is now waiting to be sentenced. The Headley revelations alarmed the Obama Administration's security team. In January, Daniel Benjamin, the State Department's top counterterrorism official, said in a speech to the Cato Institute in Washington that "very few things worry me as much as the strength and ambition of LeT." The next month, Director of National Intelligence Dennis Blair told the Senate Select Committee on Intelligence that LeT was "becoming more of a direct threat ... placing Western targets in Europe in its sights." The TTP is certainly doing so. In 2008, it plotted to bomb the public-transport network in Barcelona, though the operation was busted before it got much beyond the planning phase. If Shahzad was indeed acting on Mehsud's instructions, then the TTP has come closer to successfully executing a large-scale operation on American soil than any group has since Sept. 11, 2001. It's fair to say that many analysts remain skeptical of the ability of a group like the TTP to operate outside Pakistan and Afghanistan. Mehsud lacks the kinds of networks cultivated by the Punjabi groups among Pakistanis living in the West. The TTP's fighters also tend to be poor, unsophisticated peasants from the mountains, ill equipped for foreign assignments. Besides, Mehsud and his fighters now find themselves under attack from the air (the CIA drones) as well as on the ground (the Pakistani military) and may not have the freedom to think big. They're much more likely to seek U.S. targets close at hand: in April, the TTP attacked the U.S. consulate in the Pakistani city of Peshawar. But the TTP is working on ways to export terrorism. The group's training camps in Waziristan are a magnet for Western jihadis, including U.S. citizens. Once trained, some return home and become executors of the TTP's global ambitions. It's likely that the camps attended by both Najibullah Zazi, who confessed to planning attacks on the New York subway system last year, and Shahzad, the alleged Times Square bomber, were run by the TTP. Others will no doubt follow in their footsteps. Ashley Tellis, a South Asia expert at the Carnegie Endowment for International Peace, says there's no reason to doubt Mehsud's determination to mount attacks in the U.S. "His group has taken very big hits from the drone campaign," he says. "He's looking for payback. We have to watch the TTP very carefully." LeT has the same intent but much greater capabilities. It has larger international networks and access to more sophisticated urban and educated recruits - people like Headley, who can move freely in American society. Its foreign operations tend to be better planned, often in collaboration with other groups, like al-Qaeda and Jaish. Perhaps LeT's greatest strength is the patronage it continues to receive from the Pakistani military and intelligence services. And it enjoys genuine popularity in large parts of the country, where it offers social services that the government cannot provide. After the devastating 2005 earthquake in Pakistani-controlled Kashmir, LeT volunteers were often the first to arrive on the scene and provide valuable assistance. Like Hizballah in Lebanon, LeT and other Punjabi jihadist groups wield a combination of military and political power that makes them practically untouchable. How can the Pakistani groups be combatted? Bruce Riedel, a counterterrorism expert at the Brookings Institution in Washington, says the Administration's best bet is to launch a "global takedown" of Pakistani jihadi cells outside Pakistan, especially in Britain, the U.S. and the Middle East. "These external bases are the most threatening to us, much more than their operations in Pakistan," he says. As British authorities - who have had more experience with this challenge than those in the U.S. - know very well, such a takedown involves long, hard work by a host of law-enforcement agencies. And while the good guys are increasing their capabilities and understanding of the threats facing them, so are the bad guys. The Times Square bomb plot didn't go as planned. But as Riedel says, "We can't rely on them to be bad bombmakers forever."